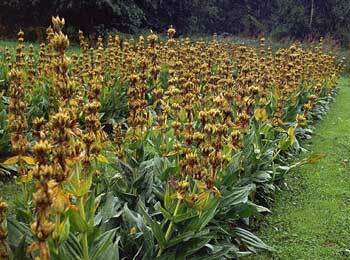 Yellow gentian is an herbaceous perennial plant; ringed and forked, the thick, wrinkled root is brown on the outside and yellow on the inside. The simple, erect, glabrous stem grows to a height of 3-4 feet and bears ovate-oblong, bright green leaves that grow up to a foot long and six inches wide. Each pair of opposite leaves is arranged at right angles to its neighboring pairs, the lower ones on short petioles, the upper sessile. The large, bright yellow flowers usually appear for the first time when the root is about 10 years old. Blooming from July to August, the flowers grow in whorls of 3-10 axillary blossoms near the top of the stem. The fruit is an oblong, two-valved capsule. Other varieties: Blue or American Gentian (G. catesbaei) grows in wet places from Virginia to Florida and features large blue flowers from September to December, Fringed Gentian (G. crinita) is a biennial species producing solitary blue, fringed flowers during September and October growing in moist ground from Quebec to Georgia, Stiff Gentian or Agu-weed or Gallweed (G. quinquefolia) is an annual species with square stems and purplish-blue, bristly flowers that bloom from August to October grows from southeastern Canada to Florida, Michigan, and Missouri and G. campestris plus wild species, etc. All of these can be used like yellow gentian. The Chinese use G. scabra and their name is Lung-tan. Found in mountain meadows and pastures in Europe and Asia Minor and under cultivation in the United States. The gentians take their name from Gentius (second century BC), the king of Illyria, who was said to have first discovered the medicinal value in these plants. Actually, an Egyptian papyrus, found in a tomb at Thebes and dated about 1,000 years before Gentius, describes medicines containing plants of the gentian family. Several bitter herbs are used, almost as equivalents to gentian, so the nomenclature is not entirely specific. The names Kirata, Katuki, and Trayamana are names in this category. The mountain farmers considered G. lutea to be a pesky weed. The gentian plant is intensely bitter without being nauseous. The bitter principle is extracted by water or alcohol. Usually used in composition with other herbs, it is popular in the mountain regions of Germany and Switzerland, where it is known as Enzien. Use gentian in mixtures with orange peel or ginger added. The beauty of this plant was not the sole cause of its becoming a rarity. It was dug up with increasing frequency for use in making enzian, a spirit distilled from its roots. Through a garden center you can purchase a yellow gentian as an ornamental for your garden, but raising this plant for its roots is not recommended. An excellent and reliable tonic and blood purifier. Good for liver complaints and dysentery. Most effective for jaundice, hepatitis, enlargement of liver and spleen, and rheumatism. Prevents cramps and convulsions. Excellent for the liver and spleen. Gentian root will improve the appetite and strengthen the digestive organs. Good for gastritis, indigestion (its most common use is as a digestive bitter with alcohol), heart burn, and stomach aches. When used for these conditions, gentian should be taken 30-60 minutes before meals. Increases circulation, benefits the female organs, and invigorates the entire system. Useful in fevers, colds, gout, scrofula, and acne, rashes, obesity, ulcers, some cancers, diabetes. Expels worms. Excellent in suppressed menstruation and scanty urine. Because of its bitterness, it is better to combine gentian root with some aromatic herb such as a small amount of licorice. It is more effective than quinine. Allays poison from insect and snake bites. 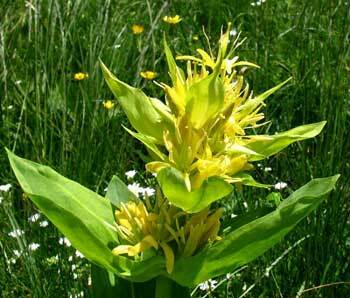 Yellow gentian is useful as a blood-builder during convalescence, since it raises the white blood cell count. Kills plasmodia (organisms that cause malaria) and worms. Used externally as a wash for wounds and inflammations; also fresh leaves placed on open wounds and inflammations act as a refrigerant; and they are soothing as footbaths. Native Americans also applied an infusion of blue gentian root to relieve backache. Chinese use one of their species for pelvic inflammatory disease, genital herpes, venereal sores, and venereal diseases. The root is the part used for internal treatment. For external use prepare a tincture from the root and flowers. (The dye derived from coal tar is called Gentian Violet. It is a widely used stain in histology, cytology and bacteriology. Used therapeutically as a topical anti-infective. Its chemical name is hexamethylpararosaniline. Has nothing at all to do with the gentian plant). Diluted to one part to 12,000 the bitter taste of gentian is still apparent. Take 1/4 to 1/2 tsp. of the powder in a cup of water 3 times a day, 30 minutes before meals. Infusion: put 2 oz. root in 1 pint boiling water and steep until cold. Strain and add 1/2 pint or more brandy. Take 1 tsp. to 1 tbsp. at a time. Decoction: Boil 1 tsp. root in 1 cup water. Take 1 tbsp. every 2 hours or before meals. Cold Extract: soak 1 tsp. root in 1 cup cold water for 2 hours. Take 1 cup in the course of the day. Tincture: take 10-20 drops in water, before each meal. Powder: take 1/4 to 1/2 tsp. before each meal. Gentian should be taken in small doses and Never by pregnant women.